BIAFRA: WHY DO YOU HATE NNAMDI KANU? WHY DO YOU HATE NNAMDI KANU? There is another set of senseless individual who refer to KANU as a coward, their very lame reason being that KANU ran away when Nigeria terrorist organization in the guise of military came to assassinate him. OK, let's view it from your own perceptive; so KANU forms Jet li, sits comfortably in his house and offer his head on the gallows so he can fall into your understanding of a True Hero. So who will fight for your freedom? Who will speak the minds of the oppressed? Who will lead the arrogant, difficult and very demanding Igbos? Who will tell the doubting Thomases of Delta, River, Calabar etc... That they all originate from the same ancestors as the Igbo man? Who would stand in front of the federal high court to challenge Buhari and the very corrupt chief justice Binta Nyako? Who would teach us the History we were denied in school? 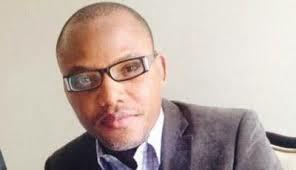 Who will give multitudes of Biafrans hope again? You insult him and call him a Lunatic? Why? Because he is screaming the truth to a corrupted and deaf world? Because he has resolved to remain incorruptible in a country oozing with corruption? Because he has continued to express his right to freedom of speech and self determination after everything the government has been doing to shut him up? You call him uneducated? He is more educated than your president, than the chief justice of your nation, than all 5 eastern governors, than Nigeria and everything she stands for! Nigeria leaders cannot even tell the difference between disrupt and boycott. Between demand for referendum and war declaration. Between a freedom fighting organization and a terrorist organization. There are some who say he is doing all he's been doing for fame and glory. Did Moses spent 40 years with the headstrong Israelites because of fame and glory? But he had those? What about Martin Luther king Jnr? Abraham Lincoln? All these men fought for the people, and today they are celebrated. Why do you want Nnamdi KANU to remain uncelebrated after all he has done and still doing? You accuse him of trying to divide Nigeria? Is your leaders keeping Nigeria as one with their discriminating leadership techniques? Is Buhari trying to keep Nigeria as one by publicly admitting his hatred for Biafrans? Are Arewa youths keeping Nigeria as one with their quit notice ultimatum? Nnamdi KANU does not deserve your contempt but respect. And till you step out to do what he is doing, you might want to think twice before insulting him.